If you don't read everything written in here ... I'll seriously beat you up!! Well ... since you entered in this thread, I suppose you want some of yours banners be uploaded on AF. Now, making a banner is not that easy as you think ... making a good one is even more harder ... and I'm very strict regarding this (I can say, more strict that in the current contests) ... we don't want AF to look ugly, do we? No fanart! Only original anime art is accepted (either is a screencap from anime, an artbook, or a scan from original artist, manga in genre is alowed, if you can make a good banner out of it ). Non-anime related banners are allowed! 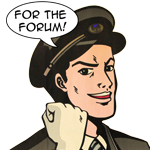 Within the forum rules. - Right part: 145px x 122px (the farest right one). Accepted formats are JPG and PNG (PNG should be used only for transparent banners - see the default one). You must add the AnimeForum.com name/link on it, well visible. On submission you have to provide the character's full name (all of them present in the banner) and the anime/manga/game/etc. they are from. For making your life easier, I made a banner template (only Photoshop users so far) where the slices are already set (made using Photoshop CS2; when opening in older versions the slices may disappear, but the guides should be still there -> in this case, export the banner to ImageReaedy -> go to Slices -> Create slices from Guides -> export back to PhotoShop and continue the work). If you can't see your banner there it means it was rejected on the spot. DISCLAIMER: by submitting the banners you're giving animeforum.com the permission of using it for any kind of promotions and displaying it on the forums/gallery or any other partner sites. I'll be happy if someone can make a template for PSP or Gimp users ^_^ with the right slices. If you don't understand what the hell I'm talking here ... well, go away then! This thread is only for submissions ... don't expect me (or anyone else) to comment or give any tips for banners. For that purpose you can always open a thread here in Dazzle Us! If you are interested into the currently uploaded banners you can check them here or click on the Banner List link you can find in the Quick Links drop down menu. Nice, I like it so far .... Previews will be done asa I finish with my exams. Last edited by Drifter Uk; 06-26-2008 at 01:33 PM. One of those days again..
Last edited by IchigoKiss; 06-25-2008 at 06:27 PM. I still lurk around, you just don't notice. Cool, another chance for more awesome submissions. Here's one from me - I should have others later. Let me know of any changes you would like. Last edited by Mira Kaiba; 06-26-2008 at 04:37 PM. I made one before this one, but I don't really like how it turned out >_> So I used an image that was easier to work with. Signature brought to you by Balance. Last edited by buhbibutterfly; 06-27-2008 at 11:37 PM. Last edited by Kaitou+; 06-28-2008 at 01:29 PM. ok, lets sort a bit. Last edited by wizz-o-matic; 06-28-2008 at 01:18 PM. K. I might redo the third. Meh. Last edited by Knuffle Bunny; 07-05-2008 at 09:18 PM. Last edited by buhbibutterfly; 07-03-2008 at 10:00 PM. Last edited by Knuffle Bunny; 07-05-2008 at 09:17 PM. This is how some would look with the repeat in place. Sorry, Im not trying to pick on anyone, I just want to show visually what will happen. Last edited by kamui_c3nmt; 07-09-2008 at 01:26 AM.